Stories of travels, battles, and brewing from the United States, Japan, and all over the world. Heather thoughtfully gifted me the recipe and ingredients for an IPA as a Valentine’s Day present. It’s time to brew! 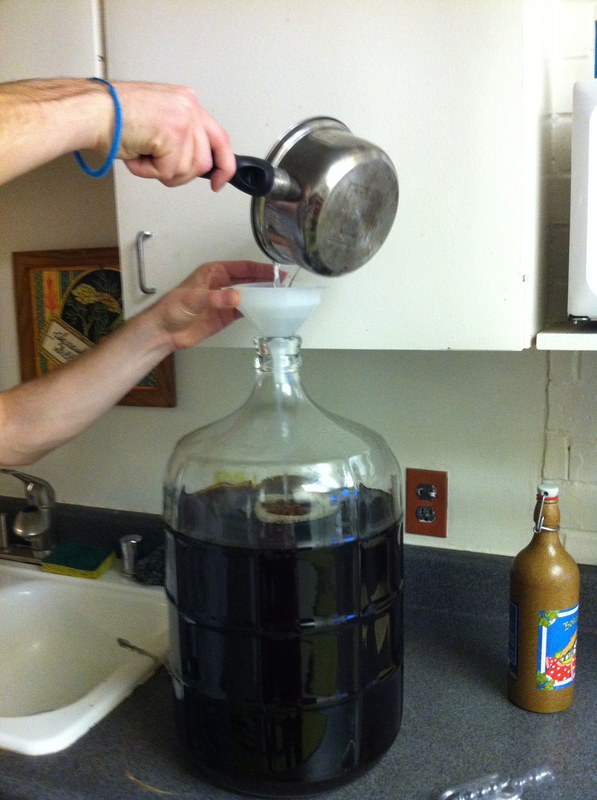 When brewing a 5 gallon extract recipe the volume of wort we add to the fermenter will be less than 5 gallons. To reach the desired batch volume we will need to add some water to the wort in the fermenter. Ideally this water will be boiled (to sanitize it) and chilled (so it won’t be too hot and kill the yeast) before we add it. As our first process improvement, while the grains are steeping we boil and then refrigerate about 1 gallon of water. It will be added to the fermenter before the yeast is pitched. With this technique we will avoid the situation we experienced while brewing the previous batch; that of not having clean water available at the end of the day. The specialty grains are steeped for about 50 minutes at a starting temperature of 170F. 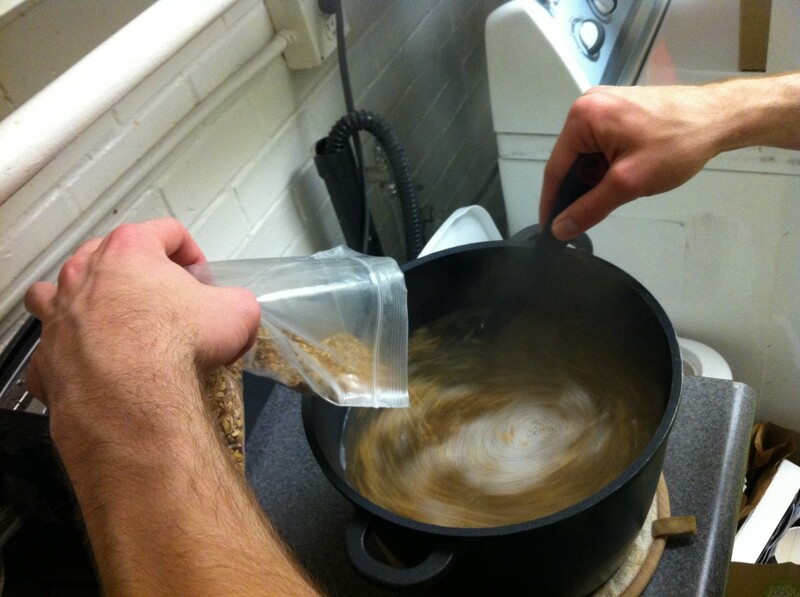 This time we do not use a grain bag to hold the grains while steeping. When the mash is done we pour the grains and water through a strainer into the brew pot. The grains collect in the strainer and a spoon is used to press them and extract as much remaining liquid as possible. Early on I burn my right hand on the handle of the brew pot. That’s all the lesson I need to remember that it gets very hot! When the boil is done we cool the wort by placing it in the sink, adding ice around the brew pot, and then filling the sink with water. The pot is kept partially covered to reduce the potential for contamination by foreign bacteria. Fully covering the pot has too much of a negative effect on evaporative cooling, and chilling the wort already takes over an hour, so I choose a half-on, half-off approach. Dinner is served while the wort cools. 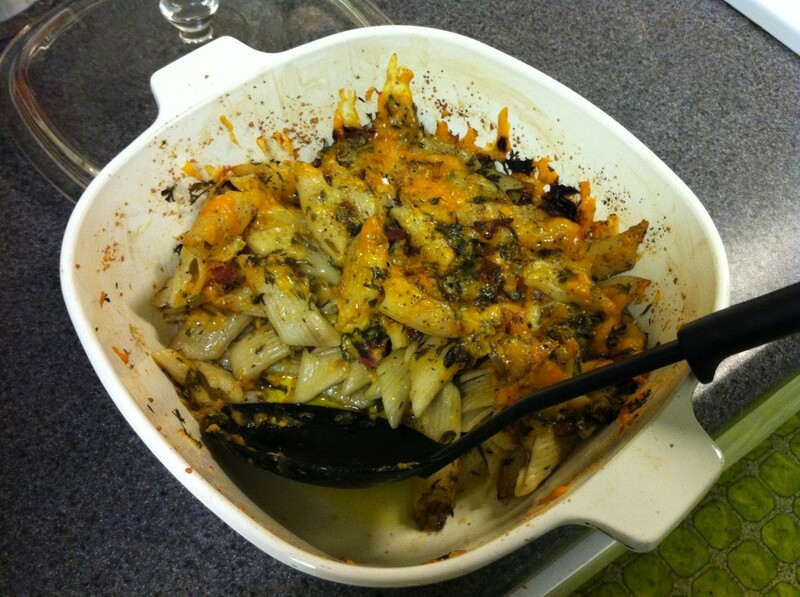 Mmm, cheesy herbed noodles! About 1 gallon of water is boiled and refrigerated during the mash. 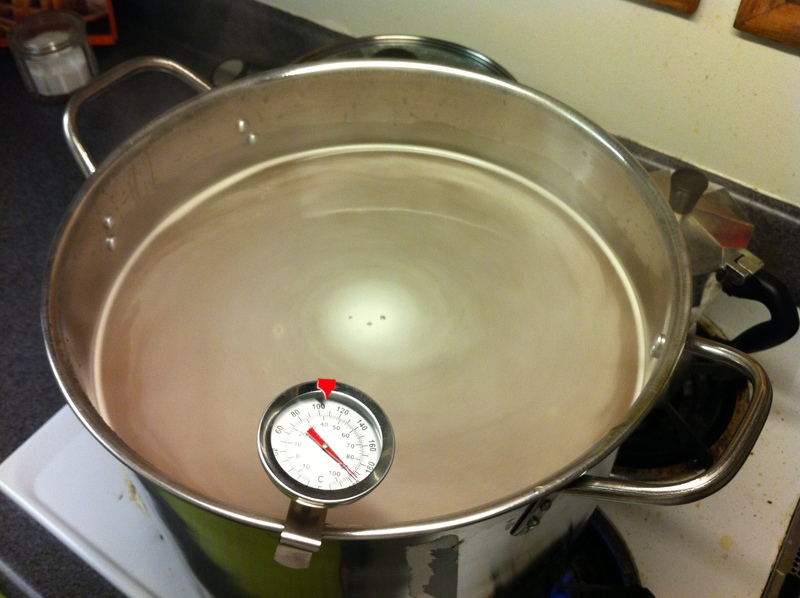 Temperature of the partial mash is 170F. 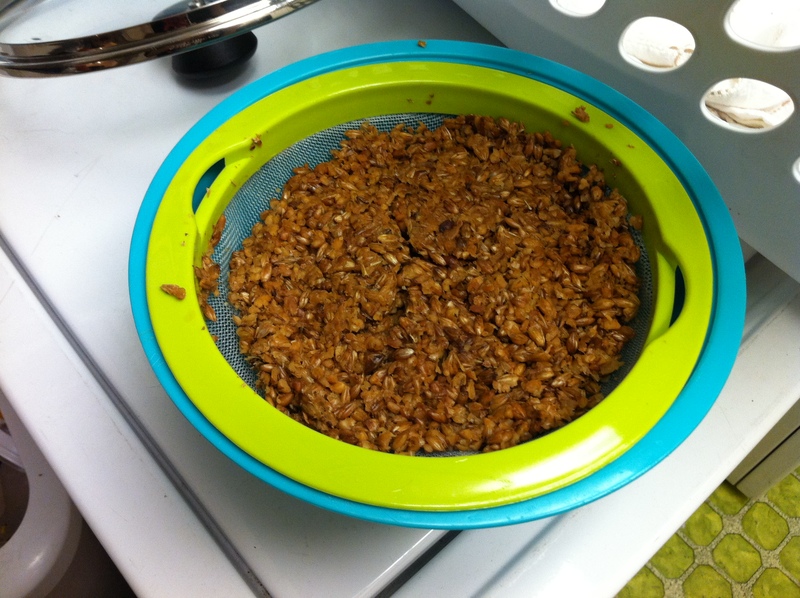 Grains are steeped without a grain cloth. 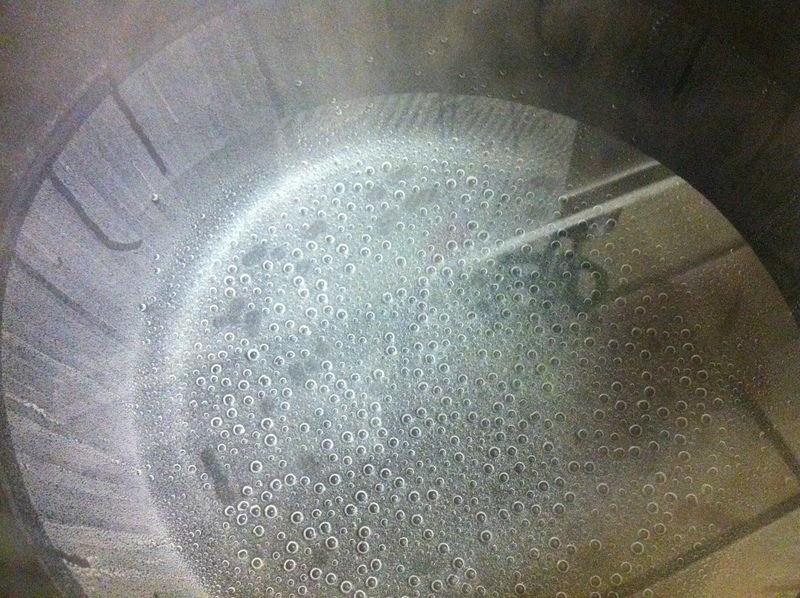 Sparging is done by pouring through a strainer into the brew pot. Steeped grains are pressed through a strainer to extract more wort. Wort is cooled in the sink, lid partially on, via an ice water bath. Cooling takes a little over 1 hour. 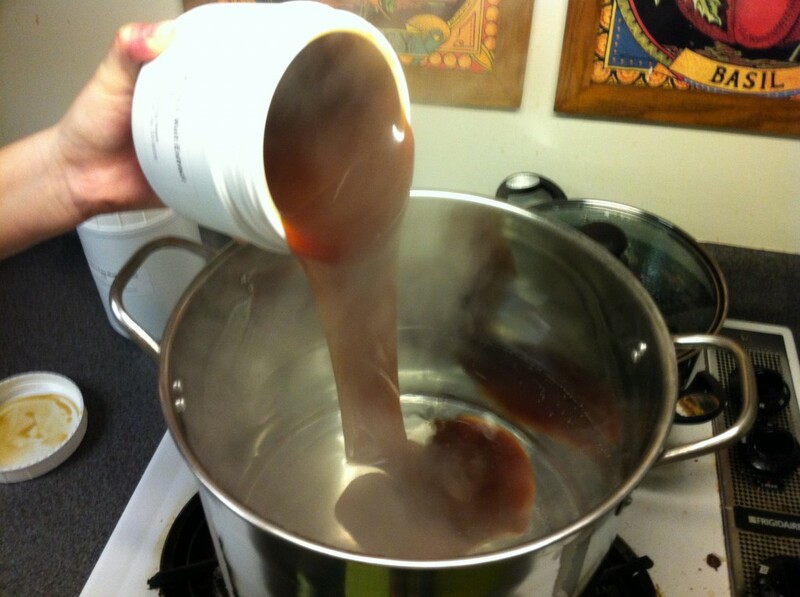 The wort is not strained while pouring into the fermenter. 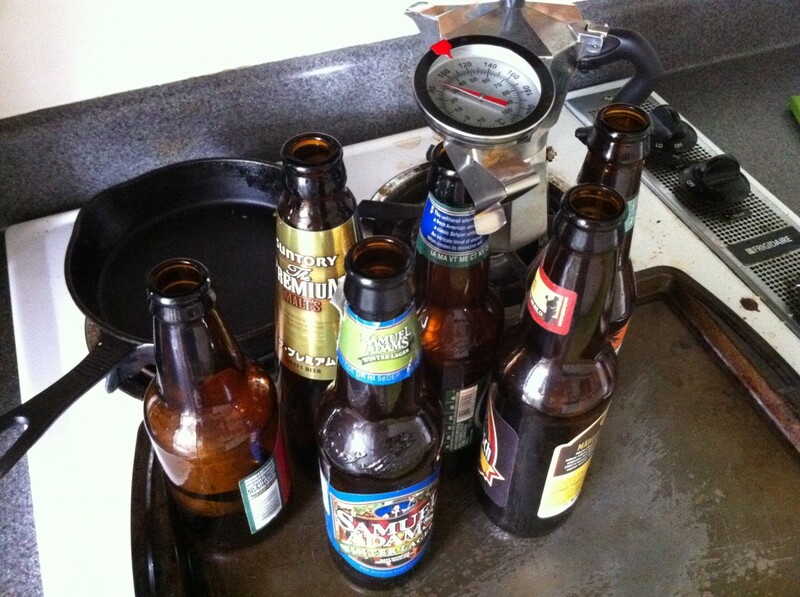 No hydrometer reading is taken, so the original gravity is unknown. This entry was posted in Brew Diary on 2011-08-25 by Joshua Beeler. I don’t have any records detailing exactly how long it took to bottle the brown ale, but I remember it taking too long. Last time we used the dishwasher for washing, sanitizing and drying. For the dubbel we will do something different. 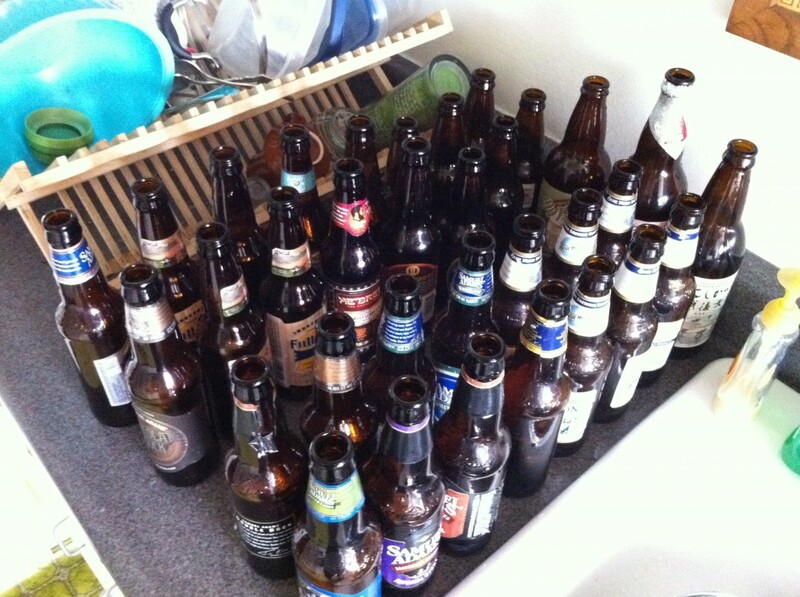 To begin, we gather all of our bottles in the kitchen. Each bottle will be washed and rinsed by hand. 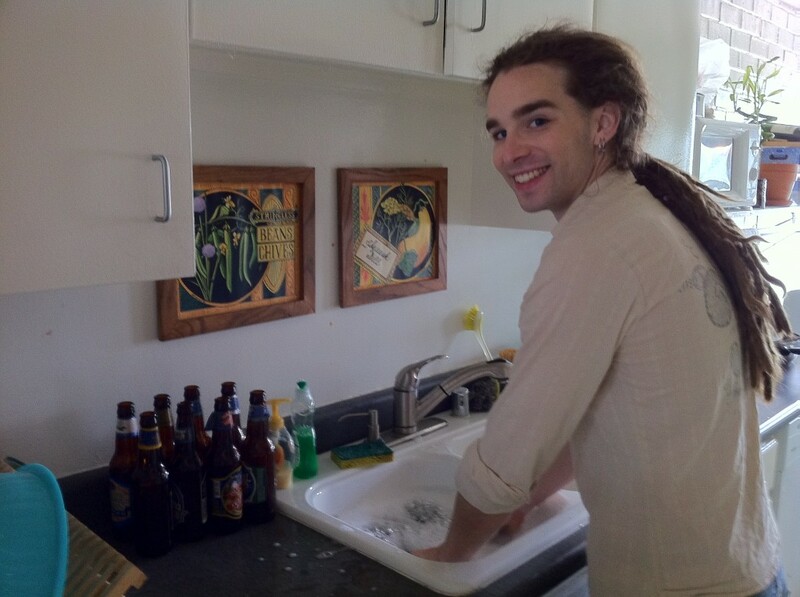 We’ve set up an assembly line procedure where unprocessed bottles are placed on the left side of the sink. The bottles are washed in the left sink basin, rinsed in the right basin, and then placed on the right side of the sink, near the oven. Man, I love doing dishes. 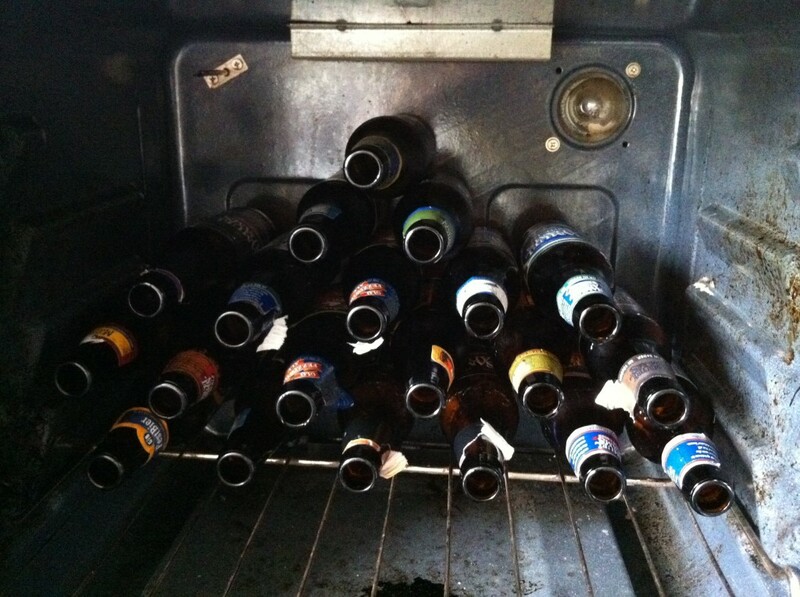 The idea is to use the oven to sanitize the bottles. All we need to do is get them hot enough for long enough. I think 180F for 30 minutes is sufficient. 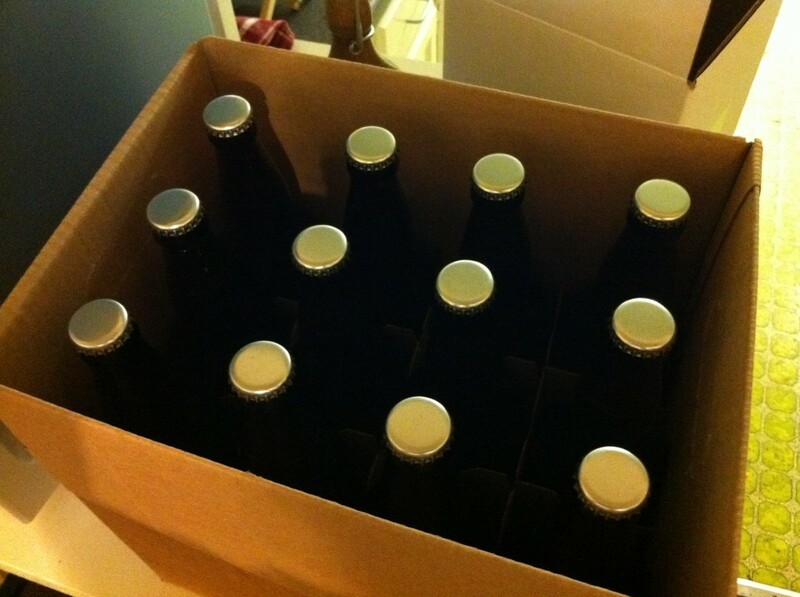 We have a small test batch of bottles baking in the oven while I’m washing the bottles that will be filled with beer. 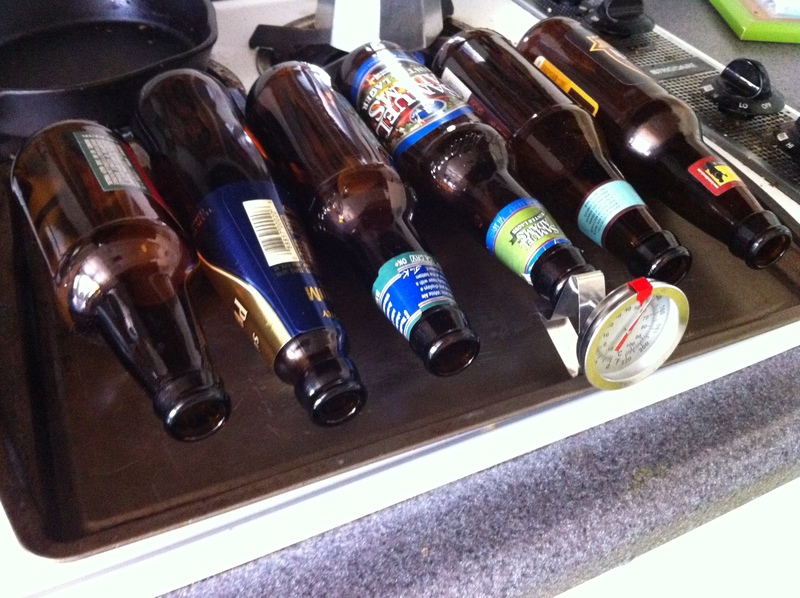 We want to get the oven up to temperature and find out how long it will take the bottles to cool. Bottles spend less time in the oven than they did in the dishwasher, but the time to cool is significant. 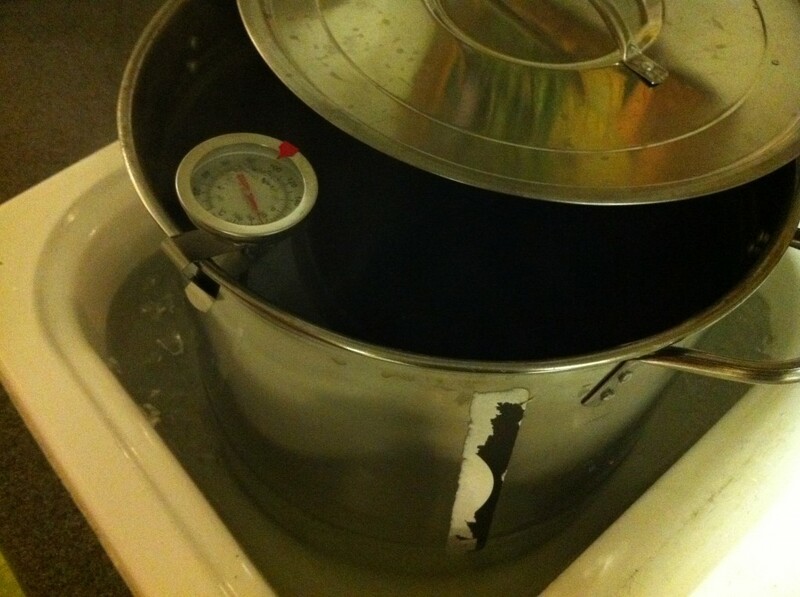 Cooling the test batch provides a few ideas for improvement. The first is that standing the bottles upright, instead of laying them down, accelerates the cooling process by allowing the hot air inside to escape more easily. The second realization is that increasing the airflow over and around the bottles also speeds up the cooling process. 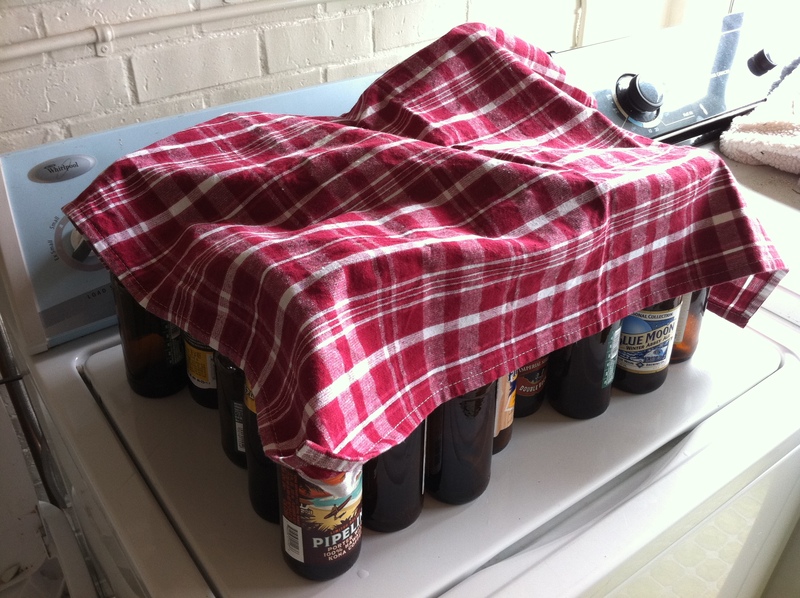 For that, we open the windows and place the bottles on top of the washing machine in the kitchen. The kitchen has a nice cross breeze going through it. We develop a scheme for stacking the bottles in the oven that allows us to bake all of them in two batches. We start the cooking and take a lunch break. 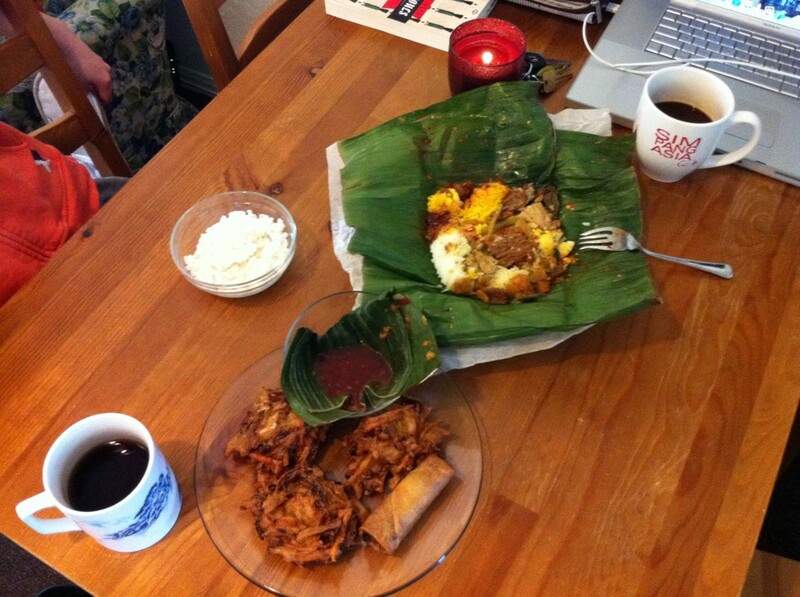 Indonesian food. Yes. 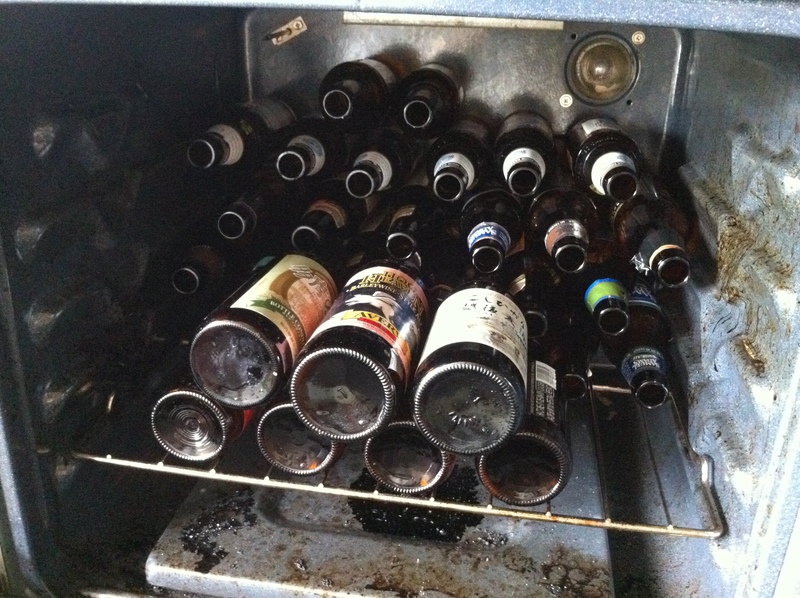 The bottles are removed from the oven and set out to cool. Another way we hope to speed up the day is by reducing the number of bottles we fill. To accomplish this, we run to the brew store and purchase a dozen 750ml bottles to use. We return and remember that the beer hasn’t been primed yet. D’oh! A warm water and dextrose solution is added to the beer and we wait. 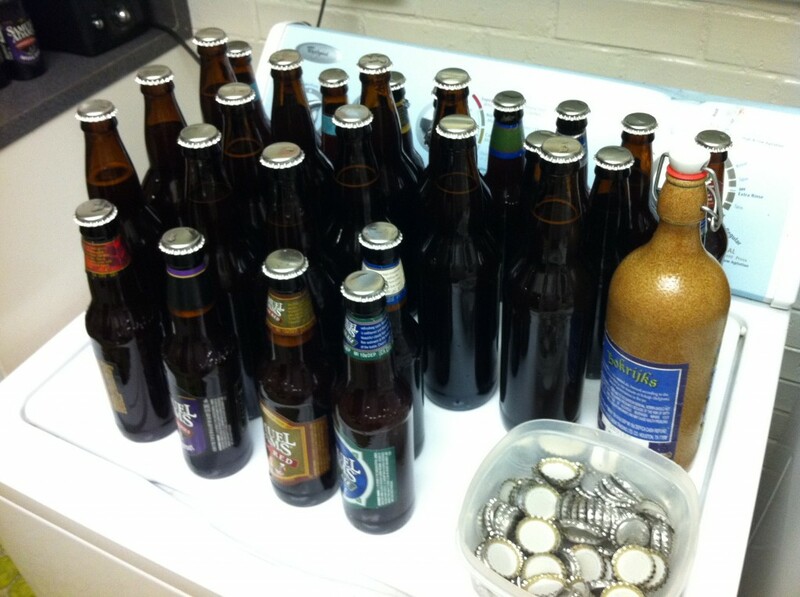 An hour later the beer is primed and the bottles are cool to the touch. We fire up the auto-siphon and begin filling, which takes about 35 minutes. A system is needed to keep track of which beer is in which bottles, now that there are multiple batches in the storage closet. 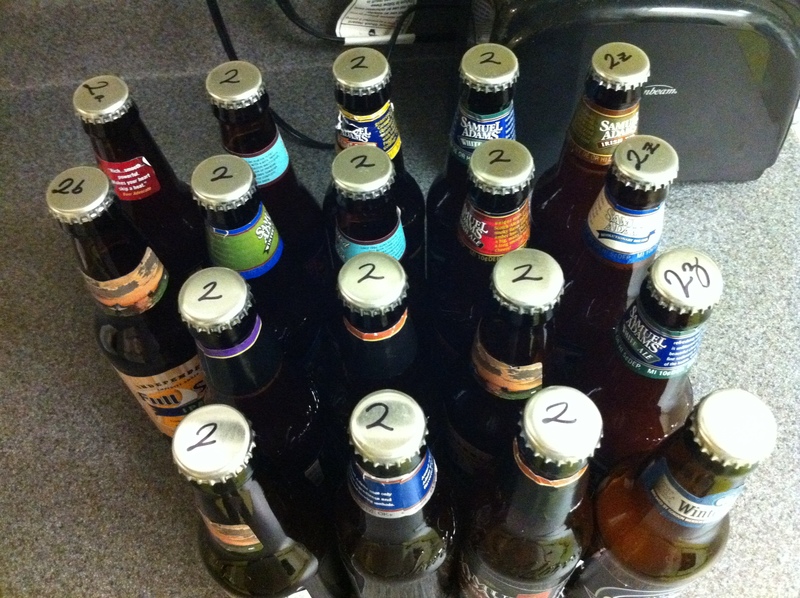 We decide to write the batch number on the top of each bottle cap. All of the dubbel bottles get a number 2. The total time for bottling this batch clocks in at 5 hours. Not that much of an improvement. In addition to not being fast, using the oven has the unwanted side effect of weakening the bottles each time they’re cooked. I don’t think we’ll use the oven again, but it was a good experiment. 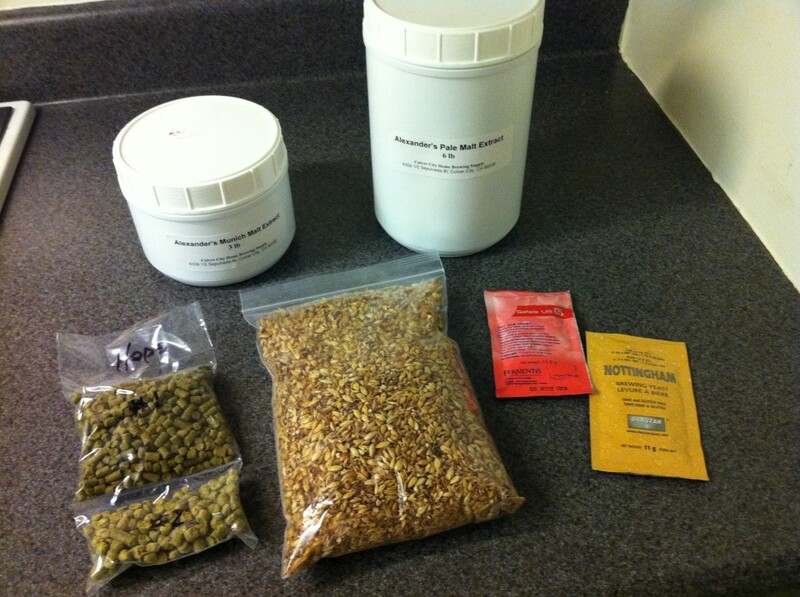 This entry was posted in Brew Diary on 2011-08-14 by Joshua Beeler.